Large Heavy Duty 8 Brace Standtastic Adjustable Christmas Tree Stand is designed to hold big Christmas Trees in homes with high ceiling, churches, offices, country clubs and other places where stability and reliability are required. All Brace Mounts, Brackets, Braces, screws and hardware are supplied. You will need a ratchet, a 7/16 and a 9/16 socket, screwdriver, drill and 3/8th bit. You will supply a 4'x4' sheet of ¾" plywood or 1/2" plywood doubled with a piece of 2x4 that has a 1" hole drilled through firmly attached in the middle of the plywood sheet. A lag bolt is screwed into the bottom center of the trunk to leaving a 1½" Peg assembly. The Peg assembly will be inserted into the 1" hole in the 2x4 to keep the tree centered on the plywood. The Brace Mounts are screwed to the plywood to provide the connection points for the Braces. The Braces will swivel up to the tree and attach using wood screws. You must supply your water container. For a water container you can recycle a 10" tall bucket like the one used for paint and pool chemicals or use a 16"x16" wide and 12" tall plastic storage box. The lag bolt and seals compress against the tree trunk to form the leak proof seal. We provide the neoprene seals necessary to make a leak proof connection between the tree and water container. The weight of the tree will rest on the Peg assembly against the Plywood while the water container is fixed above the plywood on the Peg assembly. If the Christmas tree needs straightening simply loosen all of the Brackets at the Mounts using the 7/16 socket and gently slide to straighten and tighten. Click on Safe Christmas Products to see our 91% Positive Customer Rating. 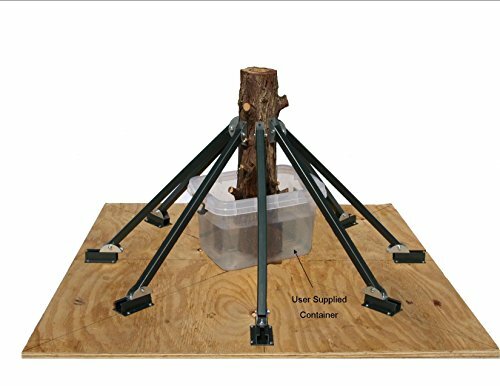 New & Improved Lifetime Heavy Duty Stand For Big Christmas Trees up to 16' Tall. All of the Weight of Heavy Trees Rest on Steel Center Pin, Not the Plastic Bowl. Double Neoprene Seals Insure Leakproof Connection to the Tree. Using Your Plastic Container or Paint Bucket Saves You the $20-$30 cost of a Container & Shipping a Box of Mostly Air. Orders by 3 PM CST Mon-Fri Ships Same Day. USPS Priority Express Next Day to Most Locations for $35.